On many hot days, a sorbet can be more refreshing than ice cream. Without any milk or cream, sorbets taste lighter and help to quell any thirst. 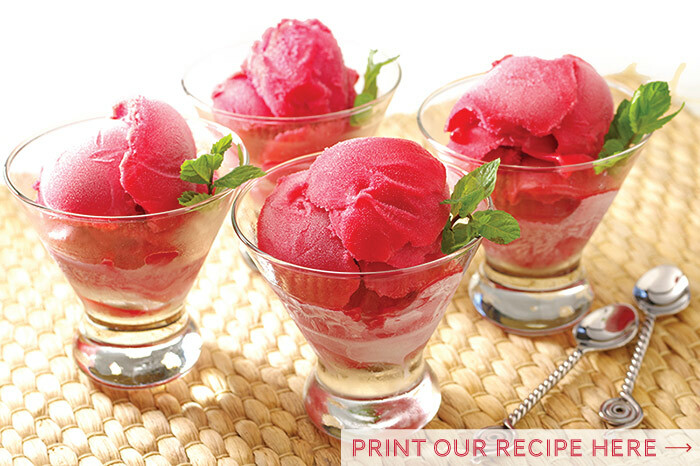 Sorbets have a simple formula that begins with a rich simple syrup – a mixture with a 2:1 sugar to water ratio. (Simple syrup has a 1:1 ratio.) Add fruit, a little lemon juice, and the magic is made. Depending on the fruit, a quick puree in a blender of food processor will assist in making a smooth mixture prior to freezing. Raspberries are tender fruits that require no blending, but have a lot of seeds. Just a bit of warmth and straining through a sieve will release their great flavor. 1. 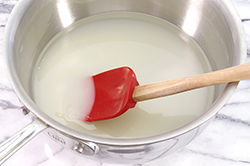 In a 3-quart saucepan, combine the sugar and water, and heat until the sugar is completely dissolved. (No need to boil the mixture; a near simmer is enough.) Remove from heat. 2. 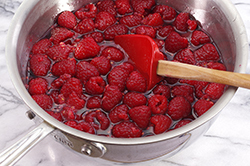 Add the raspberries to the warm water/sugar mixture, and allow the fruit to steep for about 5 minutes and softened. The berries should begin to break apart when stirred. 3. 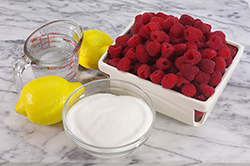 Squeeze the juice from two lemons and add to the raspberry mixture. 4. 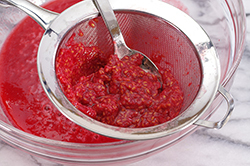 Strain the mixture into a mixing bowl through a fine sieve to remove the raspberry seeds. Discard the seeds. 5. 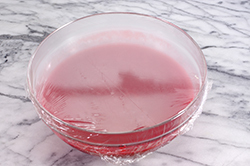 Cover the bowl with plastic wrap and place in the refrigerator to chill well – about 4 to 6 hours, or overnight. 6. Follow the manufacturer’s instructions for your ice cream maker. For ice cream makers that use a pre-frozen insert, ensure that the insert is well frozen i.e., that is has been in the freezer chilling for 24 hours. 7. 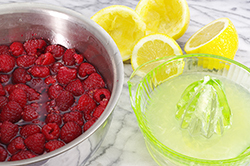 Pour the well-chilled sorbet mixture into the ice cream maker and churn with a slow, even pace. The mixture will gradually freeze and thicken. 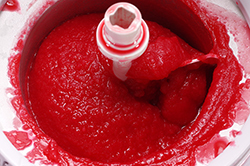 Once the sorbet holds its shape and little to no fluid or liquid areas remain, transfer the sorbet to a chilled container with an airtight lid. 8. Cover the top of the sorbet with plastic wrap placed directly on the sorbet’s surface. Apply the container’s lid, place in the freezer, and allow the sorbet to “ripen” or completely freeze for approximately 4 hours. Serve and enjoy.